UPDATE 4 p.m. ET: Anecdotal evidence suggests "Operation Chokehold" may have had some effect. In Web posts, users around the country reported scattered difficulty in accessing AT&T's 3G network on their smartphones Friday, although others said it was working fine. As for Lyons, he posted an item to his blog Friday afternoon saying, "As far as I can tell, there’s been no impact at all. My iPhone is working just the same as ever. I’m talking to someone on it right now." 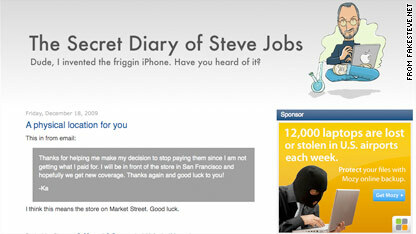 If AT&T's wireless network bogs down today, you can blame - or maybe even thank - a fake Steve Jobs. Complaining of poor service on his iPhone and angered by the company’s suggestion that it may take action to discourage heavy bandwidth users, blogger Daniel Lyons is pushing “Operation Chokehold.” The idea, says Lyons, is for every iPhone user to open a data-intensive application at noon Pacific time (3 p.m. ET) to overload AT&T's 3G network as a form of protest. AT&T, predictably condemns the effort, which has picked up steam on lots of tech-related blogs and Web sites since Lyons first wrote about it Monday. “We understand that fakesteve.net is primarily a satirical forum, but there is nothing amusing about advocating that customers attempt to deliberately degrade service on a network that provides critical communications services to more than 80 million customers,” the company said in a written statement. On Friday, Lyons was both promoting and downplaying the effort. He said he and supporters have “already won” with the attention they’ve drawn to the network’s service and predicted that any “Operation Chokehold” effort won’t actually do much to cripple AT&T's service.